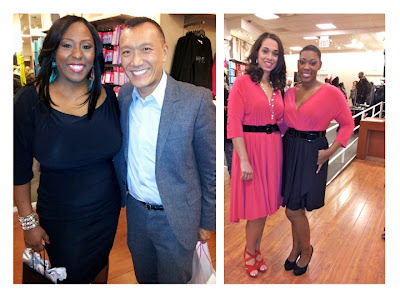 Last night I popped by the Lane Bryant in-store event where they showcased a few designs from Qristyl Frazier from All On The Line with Joe Zee. It's a little confusing but if I'm reading the press release correctly this event was to preview the episode of All On The Line which airs tonight where Qristyl was part of a "full figured fashion rehab" in which Group President Brian Woolf and other execs would determine if her designs would be sold at the retailer. *whew* Ok so the party...it was certainly nice to get a chance to chat with Joe Zee about his thoughts on plus fashion and I was pleasantly surprised at his take. As Creative Director at ELLE, of one of my fav mags I'd asked about his feelings on high end designers creating partnerships with companies like a Lane Bryant a'la Versace for H&M and he was all for it. 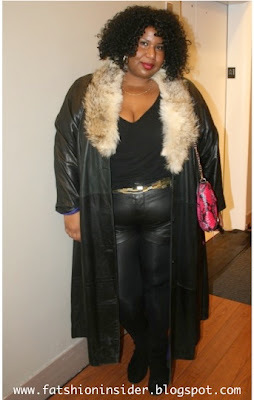 He exclaimed "I'd love to see a brand like Versace create things for Lane Bryant, why not? Why not make great designer pieces that are affordable in all sizes". Oh Joe, so kind and so gracious...but since Donatella had a hissy over women bigger than size 6 wearing her clothes in the NY Daily news, I seriously doubt she'd cut a nice full 20 or bigger for moi. Hell, a 14 even. (yeah, google it.) So maybe someone else? Marc Jacobs? Pretty please? 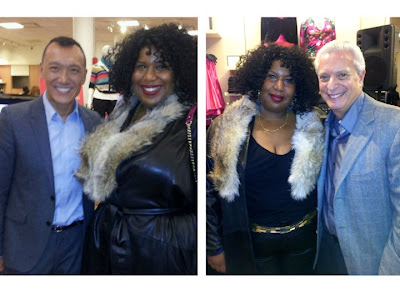 I also got a chance to chat with Lane Bryant Group President Brian Woolf who seemed to be just pleased as punch to be there. He was so passionate talking about the brand, I was impressed. Woolf talked about wanting the store to be a place that sold fashion in plus sizes rather than a place that sold plus sized fashion. I think they are rejiggering somethings and who knows,maybe we'll see some more fresh designs coming down the pike... ? 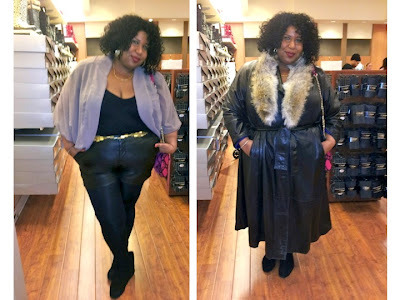 I have a few great jackets from there this season and as I poked around the store, saw a few things I actually liked. Here's a closer look at what I'm wearing. Sorry for the crap photos but my camera wasn't charged, I was rushing and late and...these are from my phone. Sorry. Last pic (the good one) taken by Madeline Jones. Thank you!